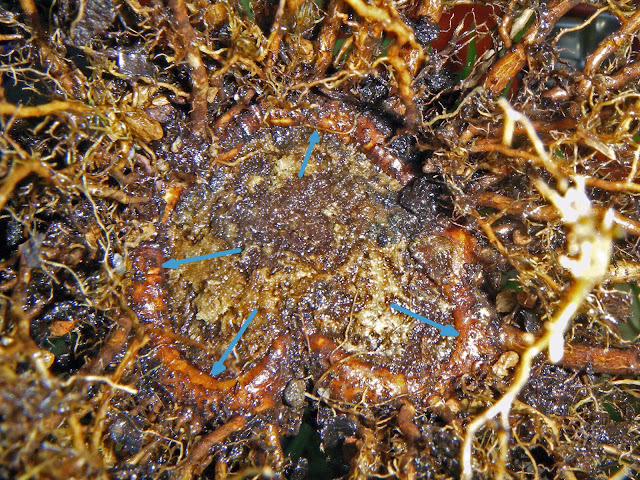 Some of you have already seen Michael Hagedorn's recent blog post, "Life Without Turface." Turface® is a high-fired calcined-clay product, originally developed to soak up excess water in wet spots on athletic fields, golf courses, etc. It has come to be widely used in soil-less potting mixes (and not just for bonsai, by the way.) But opinions about it are divided, and debate about it is very much alive here in the USA. Early in November I went to San Antonio, Texas, to attend the 2013 annual conference of the American Translators Association. There wasn't much time for sight-seeing, but I did manage to pick up some acorns of Southern live oak (Quercus virginiana) within sight of the famous old Alamo mission. 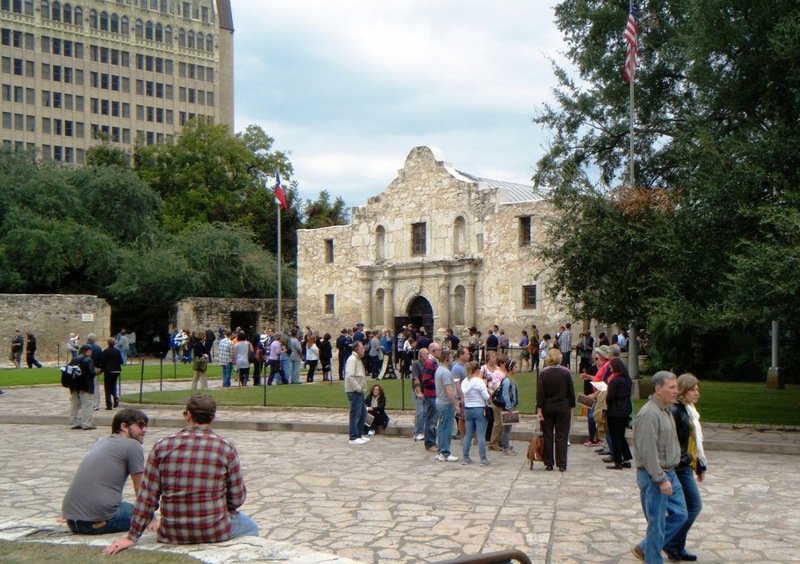 Now almost 300 years old and originally a Spanish mission, the Alamo was built largely from the fine local limestone. Participate in the Exhibit Critique, attend Bjorn Bjorholm's demonstration, go thru the Exhibit savoring the quality of the trees, touch base with friends -- what more was there to do at the Mid-America Bonsai Show, you might ask? I did have two more objectives. I read this on Willowbog's blog (thanks to "Bonsai Eejit,") commented, and moved on -- but then came back to it after a few minutes' thought. This is worth passing along. I am what one bonsai friend calls a "northern tropicals nut," so I'm a little surprised myself that I didn't get more picturess of the tropical trees on display at the 2013 Mid-Am. (But then I also have to remind myself to take pictures at all.) Let me share what I did get. Mid-America Bonsai Show 2013, Part V. Temperate broadleaves. Maples are probably used for bonsai more than any other non-conifers, in the planet's temperate zones. And the trident maple (Acer buergerianum) is, I think, the maple used more than any other. (Tho a couple of others give it competition.) In this part of the USA, I don't think anyone is more known for his work with trident maples than Matt Ouwinga of Kaede Bonsai En. Two of Matt's trident maple bonsai particularly got my attention. Mid-America Bonsai Show 2013, Part IV. Some fine display trees. A change of computer became a necessity over the last few months. My newer and more capable machine came with Windows 7 Pro. I said a regretful farewell to Windows XP Pro, and have been learning to find my way around a new operating system, which has necessarily taken some time. (I think I'm going to like 7 as well as I did XP.) Now it's time to resume some bonsai blogging. <wink> Didja miss me? 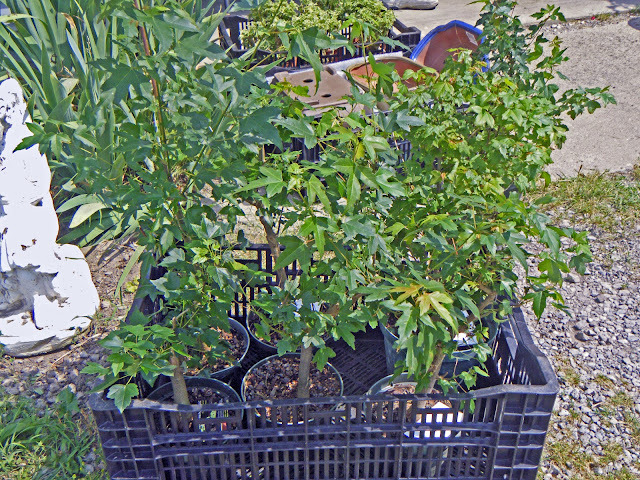 Last summer, I was scheduled to give a presentation on bonsai at the Kosciusko Community Fair. Then the local Master Gardeners (who invited me in the first place) asked if I would postpone my program until October, so it could be part of their Fall Harvest Series. I agreed. OOPS! Correction to my last post. In my last post I stated that the bonsai at Kouka-En nursery are watered four times a day in the growing season. Shortly after publishing the post, I realized that sounded excessive. I found Paul Stokes' video of this demonstration, at the ofBonsai website, and watched the pertinent segment. Somehow, I had misheard Bjorn: the trees are checked four times a day, but watered only as necessary. I have corrected that point in my last post, with a little additional information included. I apologize sincerely to anyone who was misled by my mistake. Mid-America Bonsai Show 2013, Part III. Bjorn Bjorholm's styling demo. but when there is nothing left to take away." I don't know the context in which Saint-Exupéry said that; but Bjorn Bjorholm's styling demonstration at the 2013 Mid-America Show was well enough done to bring this quote to mind! Mid-America Bonsai Show 2013, Part II. Notes from the Exhibit Critique. 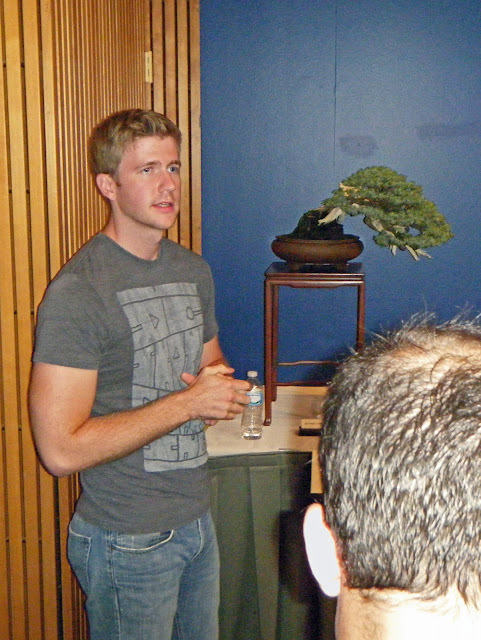 Bjorn Bjorholm discussing one of the bonsai during the Exhibit Critique. It bears repeating: an Exhibit Critique by the headliner, at a bonsai show or symposium, usually gives you the most bang for your buck when it comes to learning more about bonsai. (It also is the event that usually sells out first, too, which says something.) I was fortunate enough to get a spot in the Critique with Bjorn Bjorholm on Friday evening, the 16th. It's impossible to deal with all the bonsai in the exhibit in 90 minutes, so the teacher typically picks one or two themes and discusses trees that illustrate points in those areas. Bjorn said he would focus on principles that could be applied to any tree or in any exhibit, and most of his comments fell into the areas of horticulture and display. 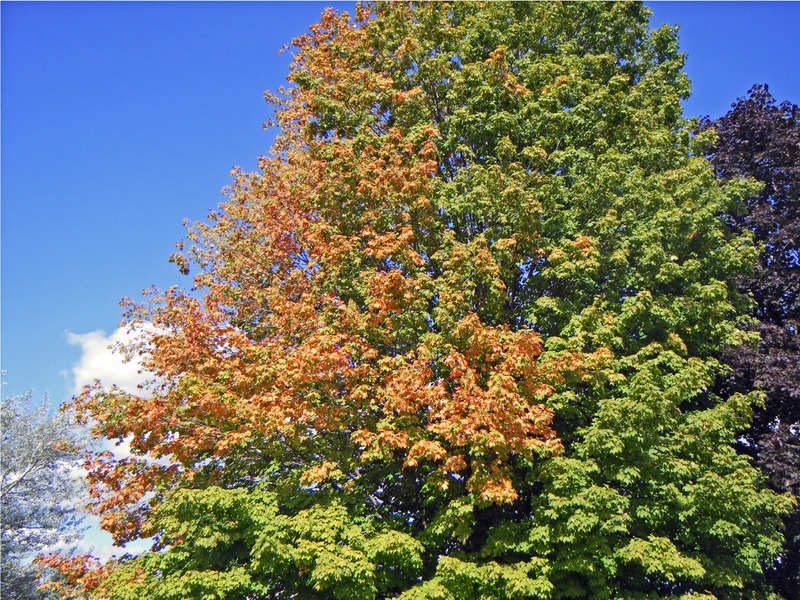 That's the natural reaction when I see a tree like this silver maple near my mother's home! One of the oddball silver maples in the county. Nebari-Enhancement Technique Results, Round 2. Thirteen months ago, I applied what I've called the "flat-cut technique" to another Ficus salicaria that badly needed a better nebari. (I think a better name for the procedure would be "flat-bottom-cut:" it gives a more adequate idea of what's involved.) You can review what was done here. Not only is there an abundance of new roots, but the trunk has a decent basal plate. View from below. Healthy callus (blue arrows) will cover the cut eventually, or so I hope. When I repotted the tree, I was able to restore the intended planting angle, which is a very gentle slant to the right -- just enough to notice. Blue-black spots on the leaves were left by birds that had over-indulged on ripe mulberries! 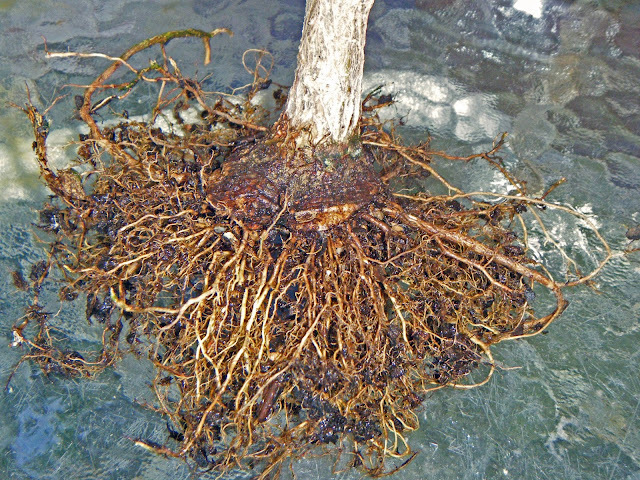 As far as I'm concerned, the flat-bottom cut technique has been validated, at least for Ficus salicaria. 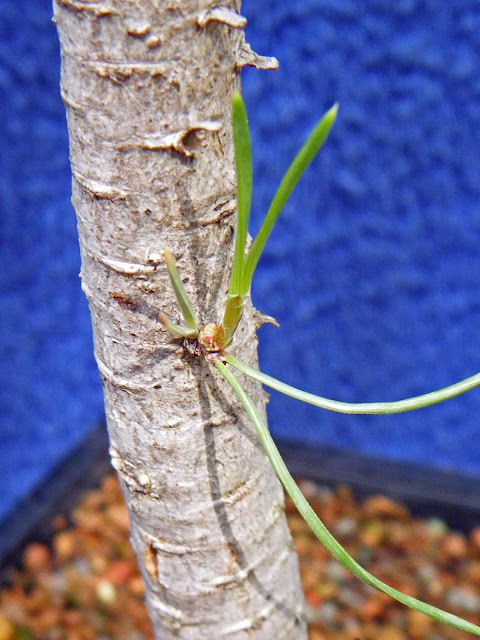 I have heard success stories from others who have used it on F. microcarpa, and I intend to use it on that species myself if the need arises.I also intend to try it in the future on other Ficus species, such as F. burtt-davyi. (I suspect F. benjamina would be a good candidate for it.) It may well work for other fast-growing species, such as Schefflera arboricola. I have a soft spot for woody plants that "deserve a chance to be bonsai." That's usually the reason why I buy potential bonsai that I don't plan to keep in my own permanent collection: I get them started as bonsai-in-the-making (experiencing some of the joy of creation as I do,) and then find buyers for them. This is such a tree. By mid-September it should be thoroughly re-established, and I'll offer it for sale at the Fort Wayne club's Fall Show. "And here Comes ... Feetlebaum." "Feetlebaum" was also what I nicknamed one of my in-development ponderosas, the one that was lagging farthest behind all the rest this spring. As of mid-June, Feetlebaum's buds, while alive, still had not opened. But in the last five weeks, Feetlebaum has made very encouraging progress! The new needles have opened; the gray arrow in the first picture points to some of them. Next year's branch-end buds have set; see the next picture. 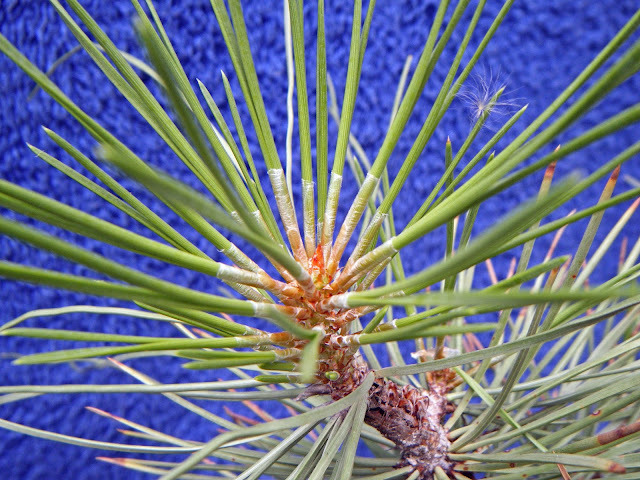 Next spring's apical bud, set and maturing. And -- the most encouraging development -- Feetlebaum is doing well enough to break, and sustain, an adventitious bud on the lower trunk. Breaking of adventitious buds indicates a tree with plenty of resources available. In the Spike Jones piece, 20-to-1 underdog Feetlebaum somehow comes from behind to win the race. This tree has not "passed the field" -- others in the project are still further along in development -- but it's sure doing better than it was! Summer heat seems to be creating problems in some unusual places. Even a couple of bonsai-blogging friends in Northern Ireland have reported temperatures up to 33 ° C (91.4° F,) which apparently is quite unusual for them. While we here haven't had the extreme heat and drought of last summer, we just went thru the first "heat advisory" of the season, and I'm sure there will be more. 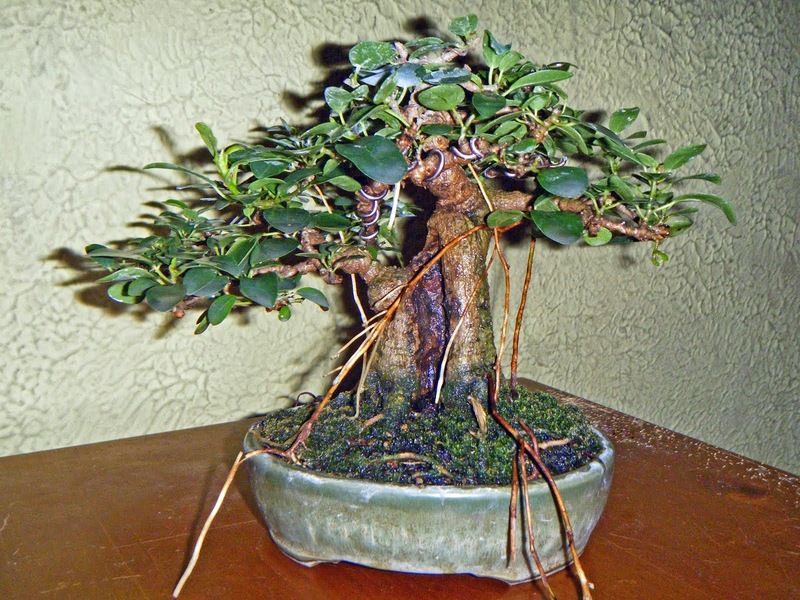 Wayne Schoech of "Bonsai Bark" blog thoughtfully reposted an item from Michael Hagedorn of Cratageus Bonsai, that has to do with summer heat. I did a little digging, and here are excerpts from two posts Michael wrote about the Japanese practice of hamisu. "The Best-Laid Schemes;" Demo at Fair, Part 2. Gang aft agley [go oft astray]." Actually, plans for a bonsai presentation at the Kosciusko Community Fair on Saturday, July 13th, haven't really gone "agley." The Master Gardeners have asked me to postpone my program until their Fall Harvest event at the beginning of October, and I have agreed. The topic will still be bonsai with tropical trees, and the presentation will still be open to the public. 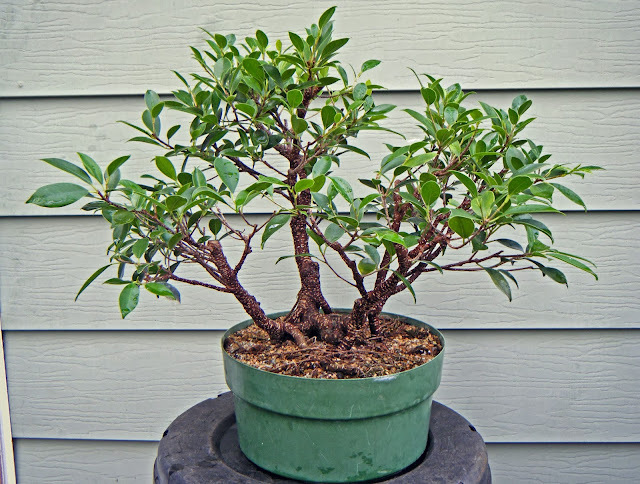 Saturday afternoon, July 13, at 2 PM, I'll give a presentation on bonsai at the Kosciusko Community Fair, under the auspices of the Kosciusko County Master Gardeners. If you are in or near Warsaw, Indiana, that day, please stop by. The Home and Family Arts Building has a workstation purpose-built for demonstrations, and that's where I'll be. -- that just might help. 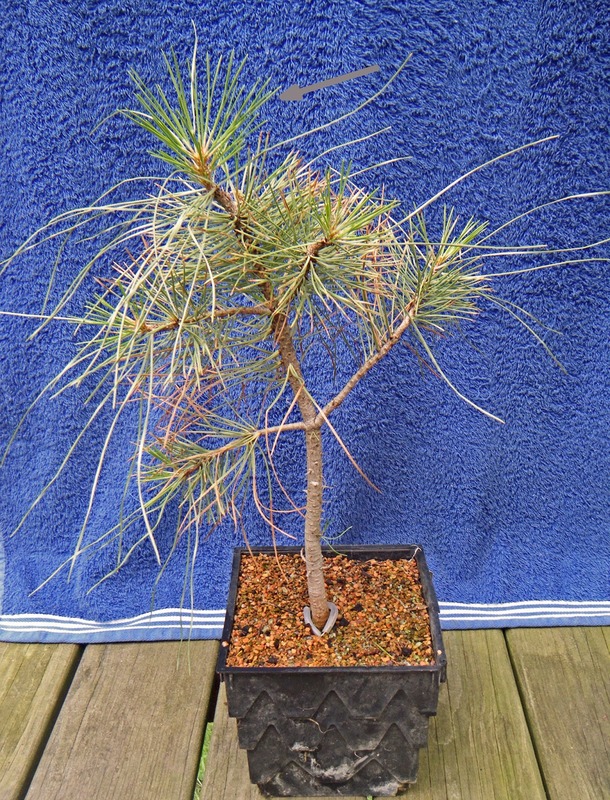 John Kirby once referred to my yamadori ponderosa pine as a "happy pine!" This season, I'm afraid, it is anything but. Many new buds failed this spring: they started to grow, then died and dried up. 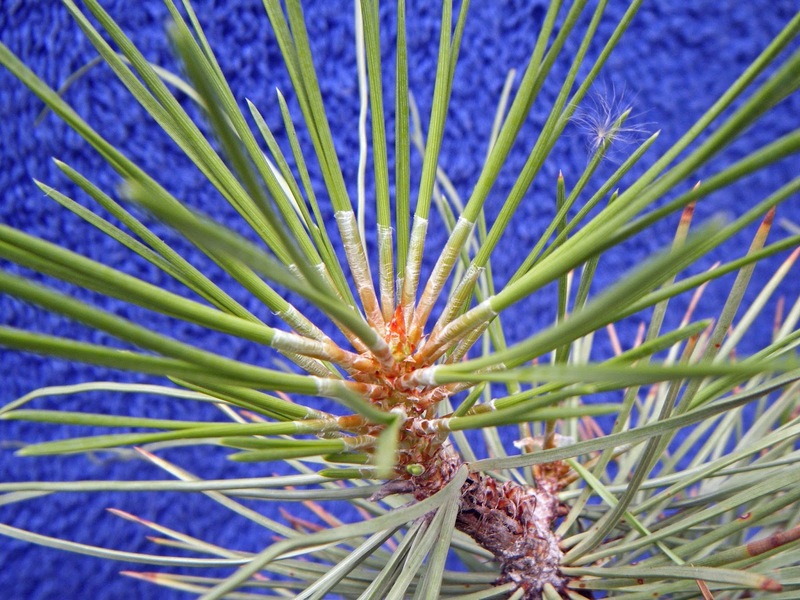 Some buds are alive and pushing new needles, but are at least a month behind schedule. Foliage from previous years is still basically healthy, but looks "tired;" I don't know how better to describe it. Saturday, while my wife went to her first-ever audition for a movie role, I enjoyed the Fort Wayne Bonsai Club's trident maple workshop, led by Mark Fields of Indianapolis. Mark has been in bonsai for 46 years, he told us, having started at the age of 8. He is another on the growing list of homegrown US bonsai teachers, and the proprietor of Bonsai by Fields LLC. Some of the trees for the workshop. Mark brought along a few examples of what can be done with trident maple. Time for a progress report. Back in September I described the effects of inappropriate soil on some young ponderosa pines. The nursery soil they were in when I bought them was much too poorly drained, and I moved them into a much coarser mix last spring. One died anyway, but the rest at least survived thru the season. I try neither to hide nor to push my religious and spiritual beliefs. You'll see more of them in this post than in most of my posts on this blog; I say that for readers who are accustomed to (almost) exclusively bonsai-related content here. After our first year or two in bonsai, most of us have heard of the reason for in-ground growing: Put a bonsai-to-be in the ground, where the roots can ramble, and it will bulk up more quickly than it would in a pot. (Sometimes much more quickly.) But what do you do when you don't have room for a growing bed, even a small one? When your yard ("garden" to my British friends) isn't even big enough to win the respect of a postage stamp? Happy Birthday from my Daughter! What does the daughter of a bonsai enthusiast get her father for his birthday? If she's my wonderful 12-year-old, a new starter tree! Wild Olive Ramification. Again, "reblogged, sort of." A day or two after I finished translating José Rivera's article on his peg graft, I got another email from Paul Stokes. This one started: "I should have known ..." He had a chance to publish another Spanish-original blog post, and would I mind translating it? Peg Graft. Reblogged, sort of. A couple of weeks ago I was contacted by Paul Stokes at ofBonsai, the online magazine. He had received permission to republish an article by José Rivera of Puerto Rico; and having learned that I'm not just an until-I-die bonsai practitioner but also a professional translator, he asked if I would be willing to translate Mr. Rivera's short article into English. I agreed. 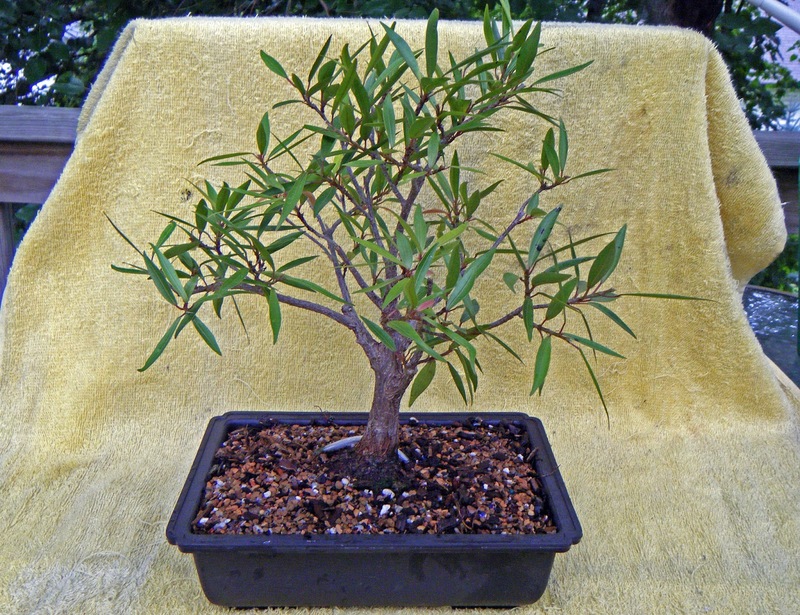 Hagedorn on Repotting: Well Worth Passing Along! I don't usually re-blog. I think you already know how to find the content you like, and that it's better to write my own and try to make it worthy of your time. The "wintry mix" weather moved on to the east Wednesday morning, leaving school delays, snow to be shoveled, and sights like these. I've lived in this country for more than 35 years now, but this sort of scene is still exotic to me. I don't usually try to create jin, shari, or uro on tropical trees, for the simple reason that you rarely see those features on tropical trees in nature. In the rainforest, in particular, dead wood rots away quickly. But I have one tropical tree that I acquired with the specific intent of turning it into a hollow-trunk bonsai. I saw it in Meehan's on-line catalog, and realized that a major flaw could make an interesting feature if my skills were up to it. When my lovely wife asked me what I wanted for Christmas that year, I was ready! But matters are now on an even keel with my dad. And even in winter, things are going on with the tropical trees in the Bonsai Crate. The "gnarly turnip. What did I have to lose? Last summer, I used the flat-cut technique on a willow-leaf fig (Ficus salicaria) that needed a better nebari. (I described the process in this post.) 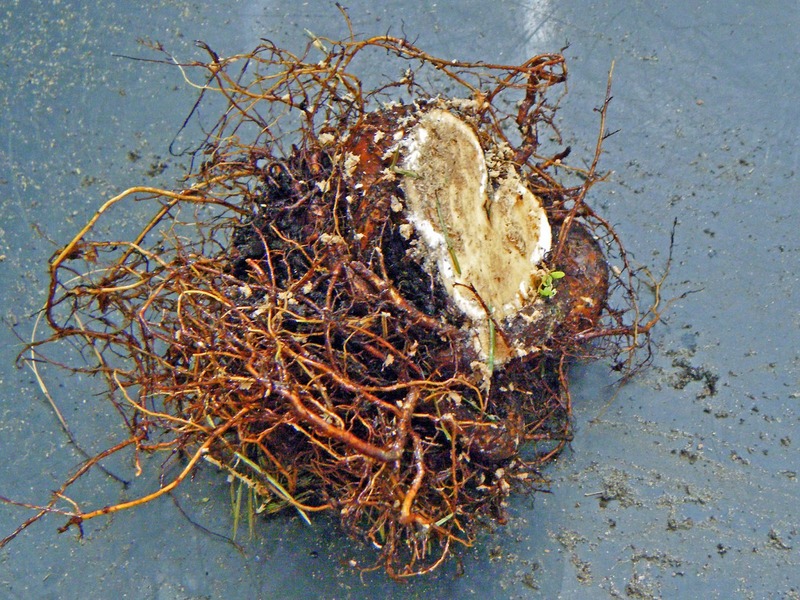 The part of the root system that I removed resembled a gnarly turnip, about the size of a small woman's fist, and at first I saw no reason to keep it. But Mary C. Miller of Miami, FL, (a.k.a. "Bonsai Mary") pointed out to me that it could make a nice root cutting. 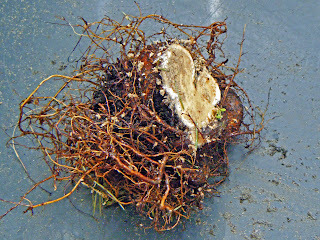 So I dug it back out of the compost pile and potted it up, to see what would happen. Within a few weeks new shoots began to appear around the perimeter of the cut, and as time passed more and more shoots appeared. This afternoon I went down to the Bonsai Crate to thin them out.